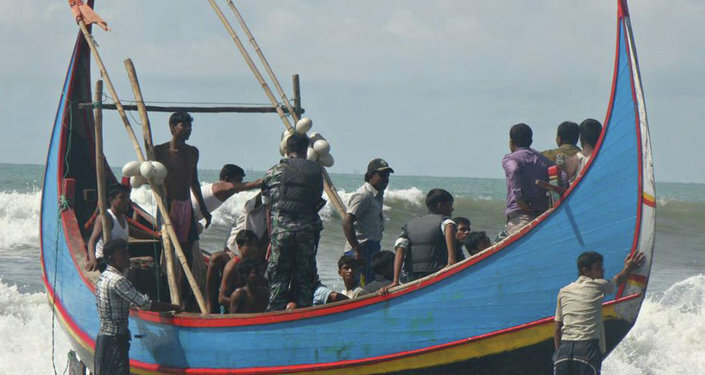 With the latest input from Bangladesh, it has now dawned upon Indian security agencies that the radicalization of the Rohingya migrants is happening at a faster pace and on a scale much larger than what they had earlier anticipated. New Delhi (Sputnik) — Bangladeshi authorities have alerted India's security agencies that a splinter group of the Bangladesh-based terror outfit Jamat-ul-Mujahideen — Bangladesh (JMB) has colluded with the Daesh and has been radicalizing Rohingya Muslims who have fled from Myanmar. The findings came into light during Bangladesh's investigation of the July 2016 terror attack on a Café in Dhaka that claimed the lives of 20 people including Indians, Italians and Americans. Though Daesh claimed responsibility for the attack, investigations suggested that the terror plot was executed with the help of the New JMB that mainly comprised Rohingya migrants. This is not the first time that Indian intelligence agencies have found links between Daesh and Rohingya refugees. A human trafficking racket busted in Delhi in January this year revealed that fake Indian passports were used to traffic hundreds of Rohingya Muslims to Saudi Arabia to join Daesh. "Arrested operatives have revealed that at least 500 Rohingya Muslims were sent to Saudi Arabia by this gang," said the Delhi police in a statement. However, JMB's involvement in the radicalization of Rohingyas has compounded India's concerns as JMB already has a conspicuous presence in India. It is estimated that about 50 JMB modules are operating in India. The network is especially active in West Bengal and parts of Muslim-majority districts in Assam. Intelligence inputs suggest that the JMB has spread its footprints in southern India and Jammu and Kashmir in the north as well. The principal objective of JMB, formed in 1998 in Banglaesh is to establish an Islamic state in Bangladesh based on Sharia (Islamic canonical law). The terror group executed its first big strike in August 2005 when about 500 bombs went off in 63 of the 64 districts of Bangladesh within half-an-hour. In the ensuing crackdown by the Bangladesh government, many of JMB's leaders and cadres were arrested or killed. It was at this stage that JMB decided to shift some of its operations to India. Experts warn that New JMB's strategy points towards a deeper collusion among terror outfits of Asia and that it could be a disaster in the making. "It is difficult for JMB to operate in India without the assistance of local militant groups. Some of the known collaborationists are Indian Mujahideen, Al Jihad, Al Ummah and Students Islamic Movement of India (SIMI). In the case of Pakistan, JMB has established a strong network with Lashkar-e-Toiba (LeT) and Harkat-ul Jihad-al Islami (HuJI). Similarly, they have built linkages with Taliban and al Qaida in Afghanistan. For its operations in Myanmar, JMB relies on Rohingya Solidarity Organisation (RSO) based in Rohingya refugee camps in southern Bangladesh. Going by the latest slogan of JMB — "Jihad from Bangladesh to Baghdad" — the network now includes the ISIS as well. The scope of networking among these terror groups includes training, recruitment, funding, information sharing, arms, operational assistance, manpower and logistics. Funding to JMB has also been traced to NGOs located in West Asia, like the Kuwait-based Revival of Islamic Heritage Society (RIHS), and even Europe," reads a paper by security analyst Dr. N. Manoharan published by the Institute of Defense Studies and Analyses. Bangladesh has resurrected a plan to relocate thousands of Rohingya migrants to a flooded island in the Bay of Bengal to prevent them from "intermingling" with Bangladeshi citizens. Meanwhile, some reports in the India media suggested that in some parts of Jammu and Kashmir, hoardings have been put up by local political outfits threatening Rohingyas to leave the state immediately or face the consequences, indicating the possibility of a severe law and order problem. Though the Indian establishment has not revealed any stringent plans of containing the multi-faceted challenges the influx of Rohingyas could pose, the slew of recent developments indicate that India would soon have to find a concrete solution to the looming crisis. There are an estimated 36,000 Rohingya Muslims in India today, concentrated in the seven states of Uttar Pradesh, West Bengal, Andhra Pradesh, Kerala, Assam, Jammu and Kashmir and Delhi.